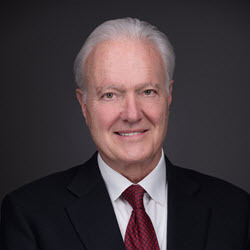 Dr. Stephen D. Ochs, a board certified physician for 40 years and a plaintiff trial lawyer of 18 years, brings one-of-a-kind insight with a balanced perspective to complex medical and medical product liability litigation. He is prepared to travel throughout the Rocky Mountain and Southwest Region to work with you on your complex Medical and Product liability cases. STEPHEN D. OCHS, M.D., J.D., M.B.A.
Having tried and litigated multiple complex medical malpractice cases across the country, Dr. Ochs understands the subtle distinctions among different jurisdictions, the complexities of the medicine, and the strengths and weaknesses of each case over a broad range of medical litigation. He was recognized by the National Trial Lawyers in 2016 as a Top 100 Lawyer civil plaintiff. In addition, he has class action litigation experience as co-lead counsel against multi-billion dollar corporations as well as national, multi district litigation suits. He brings his past business experience and educational background into play with the complex litigation and high value cases often associated with medical malpractice and product liability. Dr. Ochs is certificated in Mediation and Alternative Dispute Resolution. Medicine – A recently retired, board certified anesthesiologist with over 40 years of experience, Dr. Ochs understands the emotional and professional angst associated with medical malpractice claims. A former department chair at several hospitals, a former head of both hospital and surgery center Quality Assurance Committees, a former clinical associate professor at both Denver Health and the University of Colorado Hospital and a former owner and chief medical officer at three outpatient surgery centers, he understands and appreciates the physician’s medical frame of reference when a less than optimal clinical outcome occurs for the patient. Business – A previous founder, owner and operator of three independent, ambulatory surgery centers, Dr. Ochs has experience and knowledge in a myriad of employment, financing and regulatory issues associated with small to mid-sized businesses in the health care field. After attending the University of Colorado, Boulder, Steve was admitted, after three years without an undergraduate degree, to the University of Colorado Medical School receiving his M.D. in a total of seven years. After a one year residency in general surgery, he completed his post graduate training in Anesthesiology at both the University of Colorado, Denver and the University of Michigan, Ann Arbor. Beginning in 1997, Steve attended the evening division of the University of Denver College of Law, while practicing medicine during the day, where he earned both a Juris Doctor and Master in Business Administration. He compressed normally a 6 year dual degree program into a total of four years.